We only carry top of the line 1st cut fresh Christmas trees. These trees are harvested with the perfect shape, color and density rated by the USDA. When looking for the perfect tree you will notice the difference in the quality and freshness of our inventory. You can find more information on Christmas Trees Grades and Standards below. Most people would be surprised to find out that in many ways, artificial trees do more harm to the environment than cutting natural trees; in other words, the idea of artificial trees being eco-friendly is, as a researcher at Kansas State University put it – “an urban myth”. A study released in 2011 found that the impacts of natural and artificial trees are almost similar, with the artificial ones being slightly worse. The key here is PVC. PVC (polyvinyl chloride) is a petroleum-derived plastic. The main raw material for fake Christmas trees is both non-renewable and polluting, and you can’t recycle it. Furthermore, PVC production results in the unhealthy emission of a number of carcinogens, such as dioxin, ethylene dichloride and vinyl chloride. Also, in order to actually create the needles, lead is often times used – and lead can have a number of significant negative health effects, including kidney, neurological, and reproductive system damage. “Real” Christmas Trees are almost always evergreen conifers, such as spruce, pine, or fir. Each year, 33 to 36 million Christmas trees are produced in America. Naturally, cutting this many trees is a big problem, both ethically and environmentally, but is it worse than polluting? Harvesting a Christmas tree that was planted and has provided years of oxygen and has reduced soil erosion creates sustainability for farmers to replace these trees with new seedlings and continue to produce oxygen, remove carbon dioxide from the air, protect shrinking habitat, and replenish the soil for future generations. Live trees are typically grown as a crop and often two new seedlings are planted for every Christmas Tree that is harvested. This is how Christmas Tree farmers maintain inventory and continue to have a sustainable farm. Both providing continuous crops and often providing suitable habitat for wildlife. Sadly, even though fresh Christmas Trees are biodegradable and highly recyclable, many times trees are simply thrown away. We encourage recycling the fresh cut Christmas tree into mulch and Double D’s Tree Service provides both Delivery and Recycling of your Christmas Tree! Picking out a Christmas tree is fun! Visiting Double D’s Christmas Village is the best way to start off you holiday season! Nothing Smells Like Christmas more than a real tree! A study published in 2007 by scientists at Kyoto University in Japan revealed that the smell of pine needles can battle anxiety, stress and depression. Herbalists say pine needle tea can help boost the immune system. A real Christmas tree is good for your health! Even when (freshly) cut, real trees absorb odors and pollutant gases (nitrogen oxides, ammonia, sulfur dioxide and ozone) and filter particulates out of the air by trapping them on their leaves and bark. It’s like adding an extra air purifier to your home in December. Additionally, exposure to real greenery in the home has been proven to be therapeutic. Adding plants to hospital rooms speeds recovery rates of surgical patients, according to researchers at Kansas State University. Compared to patients in rooms without plants, patients in rooms with plants request less pain medication, have lower heart rates and blood pressure, experience less fatigue and anxiety, and are released from the hospital sooner. Real trees are better for the environment! According to the Carbon Trust, real trees have much lower carbon footprints than fake ones. It estimates that a 2-metre artificial tree has a carbon footprint more than twice that of a real tree that ends up in landfill, and more than ten times if the real tree is burnt. The Carbon Trust said an artificial tree would have to be reused for at least ten Christmases to keep its environmental impact lower than that of a real tree. You can’t turn a fake tree into compost! 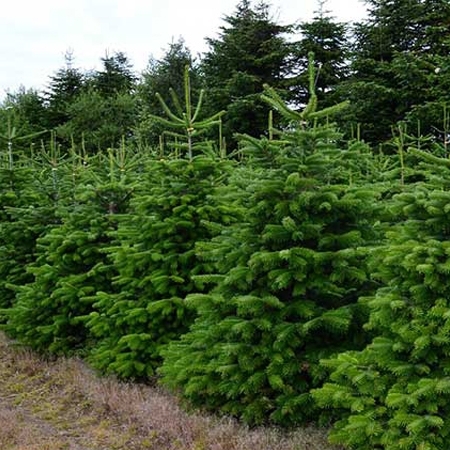 Real Christmas trees are recycled as green waste, they get mulched up and made into compost. Once again giving back to the environment.